Three5Human's new CD, A Swig from the Acid Bottle, was produced and engineered by Jeff Tomei, whose credits include some of the biggest names in music, such as Matchbox 20, Smashing Pumpkins, Edwin McCain and Jerry Cantrell of Alice In Chains. Amy Ray and Emily Sailers of the Indigo Girls both step outside of their genre to sing rock as guest vocalists. A Swig from the Acid Bottle is receiving incredible press reviews. The duo wrote their first song at that moment and never looked back. Stereo Popsicle, which is what they were initially called, released its first CD shortly afterward, generating a lot of buzz and radio airplay on three of Atlanta's top FM stations, each playing different songs: 99X (Mr. Lonely), Star 94 (Georgia) and 96 Rock (Story). This showed early on the mass following for the band across different demographics and music formats, from Rock to Pop to Alternative, the music appealed to all (and this is the true test of great songwriting!). The band started to get some interest from the major labels, but the big label machine was not quite sure how to market and sell this phenomenon. People know Black. People know Rock. But, they don’t know Black Rock. Tomi says, “The label execs would take a look at us and send us down the hall to talk to the Urban Department.” The absurdity lies in the fact that anyone who listens to the band for more than 5 seconds will realize they don’t belong in the Urban Department. Trina describes the sound as “Rock with a whole lot of Soul.” Tomi continues, “It was pretty clear that they just listened to the buzz about the band and none of our music.” Trina and Tomi were now faced with a choice: stay true to themselves and risk losing a deal or change their sound so they could get signed. So, how did they respond? They changed their name to Three5Human. It’s only fitting that a band with politically charged lyrics has a political name. Unlike the U.S. Senate where a state’s representation in number is the same among all other states, representation in the U.S. House is based on a state’s population. Thus, states with large populations have more elected representatives in the House than states with small populations. The South wanted slaves to be included in its population so they could have more representation in the House. A compromise was reachedbetween the North and South declaring that slaves would be counted as three-fifths of one person for the purpose of determining representation in the House of Representatives. So, maybe now you can appreciate what a bold statement it was to change their name to Three5Human after getting major label attention with the non-controversial safe haven that was Stereo Popsicle. It was a big risk. But, it was real and that’s what Tomi and Trina wanted. 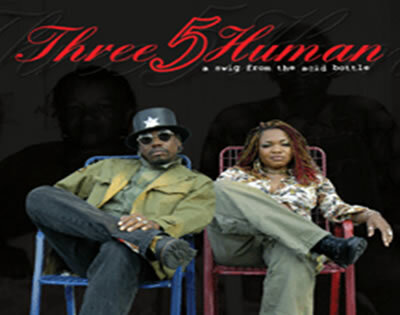 In 2005 Three5Human released their first LP under the new name, which was aptly titled Flying Below the Radar. Visit artist website at www.anaphoramusic.com/three5human/.